When thinking of celebrity culture, science may not be the first thing that comes to mind. But a new cultural icon strode the world stage at the turn of the twenty-first century: the celebrity scientist. 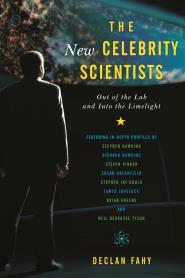 Science and fame go hand in hand in Professor Declan Fahy’s new book The New Celebrity Scientists: out of the lab and into the limelight which tells the story of how eight leading scientists evolved under the fierce glare of modern media to become something new to science: celebrities. Fahy delves into the complex, captivating world of science using both a formal and a personal approach and profiles these eloquent, controversial, and compelling scientists to investigate how they achieved celebrity in the United States and internationally. He then combines their individual stories to explore how their ideas influence our understanding of the world and helped popularise science. This engaging book traces the career trajectories of Richard Dawkins, Stephen Hawking, Steven Pinker, Neil deGrasse Tyson, Brian Greene, Stephen Jay Gould, Susan Greenfield, and James Lovelock. It looks at how, why, and to what effect these great scientists have consciously used the tools of today’s celebrity culture to make themselves, and thus science, active participants in public discussion. Fahy demonstrates how each scientist embraced the power of promotion and popularisation to stimulate thinking, impact policy and influence research and the consequences of their fame within the scientific community and society at large. Each of the scientists discussed made a deliberate decision to enter public life. Each went on to maintain a regular presence writing popular books, participating in television broadcasts, and becoming the focus of journalistic writing and scholarly analysis. He also considers critical claims that they speak beyond their expertise and for personal gain. This absorbing, critical examination of the best-selling scientists that we love, admire, and sometimes hate will challenge assumptions and change the way you think about science, celebrity, and society. Further details of The new celebrity scientists: out of the lab and into the limelight can be found on the main catalogue, available in ‘Catalogues’ on the Library’s website.